Takes power from the tail light circuit, wire #21, and converts it to 12 volts. That 12 volt power is fed into relays that are triggered by wires# 22-460 and 22-461, the left and right stop/turn circuits. The 12 volts from the power converter and relays are fed to a civilian trailer connector. 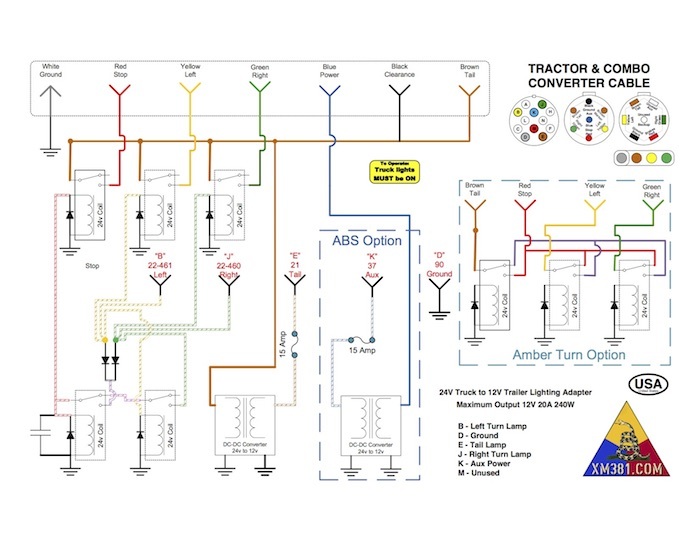 The tractor versions have additional relays that provide separate turn and stop lighting circuits for semi trailers. The adapter will supply a total of 20 amps (240 watts) for trailer lighting. The standard 12 volt 1157 taillight bulb draws 26 watts for stop/turn and 8 watts for tail. A typical trailer setup of two stop/turn/tail light bulbs (one per side) with running lights on and brakes applied will use 68 watts, leaving 172 watts for marker lights (they tend to be 8 watts or less, so at least enough power for 20 of them). Or a ridiculous number of LED lamps. A load of greater than 240 watts will overload the converter and cause it to shutdown. The converter will auto-reset once the overload is cleared. 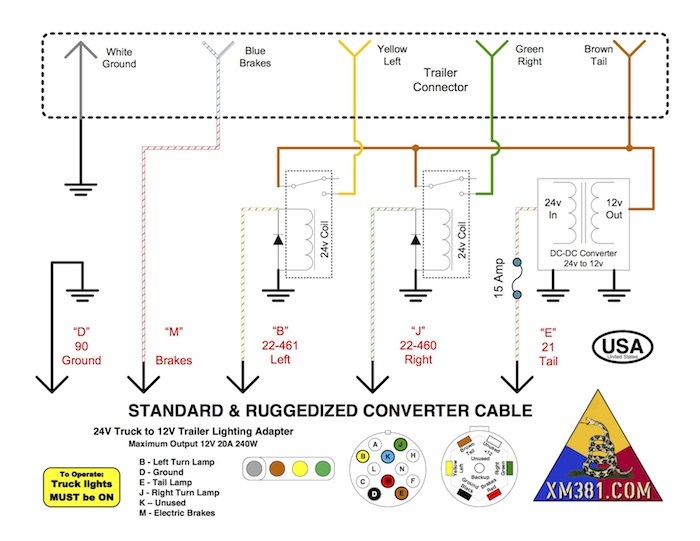 The Standard Converter Cable has a 7-Way RV style trailer connector mounted in a waterproof box and a 6’ 12 pin NATO style cable that plugs directly into any standard military truck’s trailer socket. Optionally a J560 (7-way round pin) may be installed for tag or other non-semi trailers. The Ruggedized Converter Cable is electrically identical to the Standard Converter Cable but is in a cast aluminum housing. Available in 383 Green, 686 Tan, or Black. Optionally a J560 (7-way round pin) may be installed for tag or other non-semi trailers. The Ruggedized Frame Rail Mounted Converter is electrically identical to the Standard Converter Cable but is designed for permanent instalation, in a cast aluminum housing and plugs into the trucks wiring harness at the composite tail lights. Available in 383 Green, 686 Tan, or Black. Optionally a J560 (7-way round pin) may be installed for tag or other non-semi trailers. 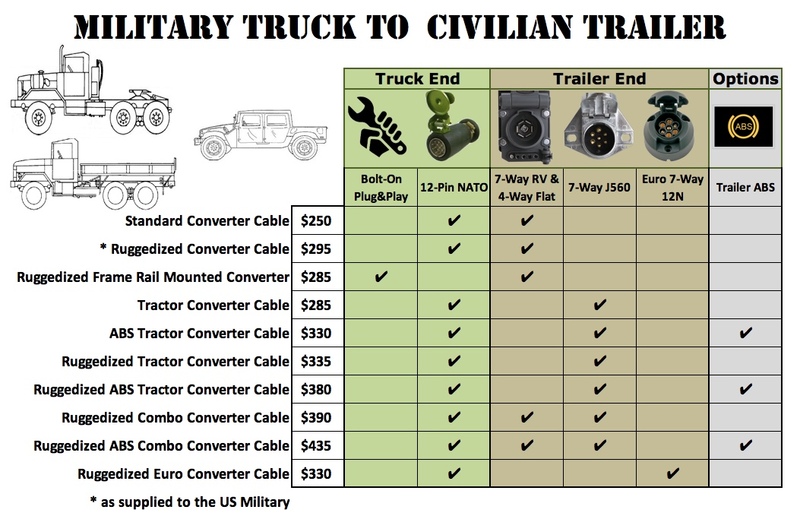 The Tractor Converter Cable has a 7-Way round pin SAE J560 style trailer connector mounted in a waterproof box and a 6’ 12 pin NATO style cable that plugs directly into any standard military truck’s trailer socket. The tractor converter cable provides separate turn and stop lighting circuits for semi trailers. The Ruggedized Tractor Converter Cable is electrically identical to the Tractor Converter Cable but is in a cast aluminum housing. Available in 383 Green, 686 Tan, or Black. The ABS Tractor Converter Cable has a 7-Way round pin SAE J560 style trailer connector mounted in a waterproof box and a 6’ 12 pin NATO style cable that plugs directly into any standard military truck’s trailer socket. The SAE J560 ABS tractor converter cable provides separate turn and stop lighting circuits for semi trailers, meets standards for ABS brakes, provides 480 watts total power, draws 24 volt power from both the Aux power and tail light circuits to provide the required redundant 12 volt power sources for trailer anti-lock brakes. The Combo cables are a combination of a Standard Converter Cable and a Tractor Converter Cable in one waterproof box, with the option of ABS on the tractor side of the converter, and a 6’ 12 pin NATO style cable that plugs directly into any standard military truck’s trailer socket. The Combo cables have both a 7-Way round pin SAE J560 style trailer connector for semi-trailers and a 7-Way RV socket plus 4 & 5 pin Flat sockets for bumper pull, gooseneck or 5th-wheel trailers. The Ruggedized Euro Converter Cable is electrically identical to the Tractor Converter Cable (European trailer stop and turn signals are wired the same as semi-trailers) and is in a 383 Green cast aluminum housing. Just plug it in to your NATO trailer socket and turn your "3 Lever Light Switch" to “Service Drive”! For non-US military vehicles, turn your light switch to the "on" position. Designed to be bolted inside the frame rail at the left rear of the truck for permanent installation. Find a suitable location and bolt the converter to the frame. Bolt the ground wire to frame after cleaning frame to bare metal for a good electrical connection. Unplug wires #21 and #22-461 from the left rear composite tail light, then using the included "Y" adapters, plug in the converters corresponding wires and reconnect composite light wires. Do the same for wire #22-460 on the right side. Bolt 7-Way RV socket to suitable location with included bracket. NOTE: The turn/stop wire metal number tag on the composite tail light assembly is marked 22-460/461 since the composite tail lights can be used on either side. The truck side of the harness is labeled 22-460 and 22-461. To operate: turn your "3 Lever Light Switch" to “Service Drive”.